I don’t know who is reading this. Whether you went to church yesterday or haven’t darkened the door in years. Whether you love God with all your heart but wonder why he allows certain circumstances in your life or whether you don’t know God at all. Whether your broken heart is the result of a relationship or a situation or both. But I know without a doubt that God has called me to pray for broken people. Because we’re all broken. 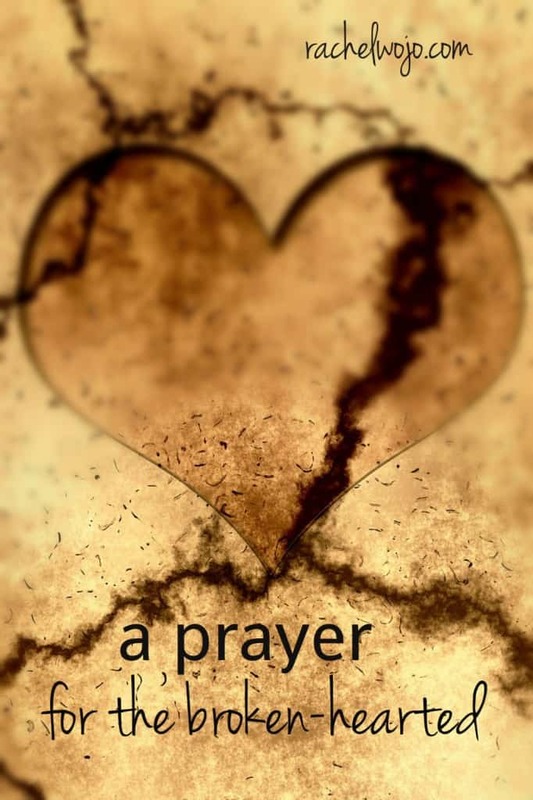 Feel free to use a prayer for the broken-hearted as your own. 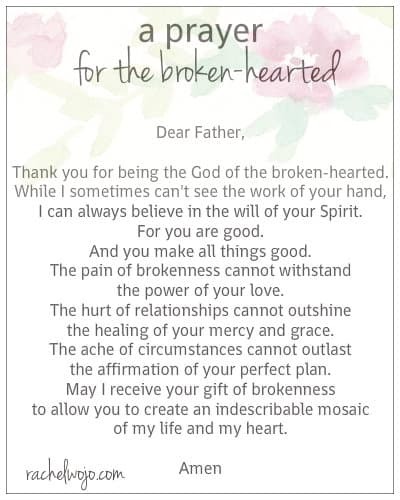 Thank you for being the God of the broken-hearted. I can always believe in the will of your Spirit. And you make all things good. the power of your love. the healing of your mercy and grace. the affirmation of your perfect plan. of my life and my heart. I needed this today!!! I need confirmation that God hears my prayers even as unworthy as I am. TY,Rachel! I have been asking God to speak to me about some situations/relationships. My heart has been anxious and sad,so I truly needed this! God bless you! This is really good for the day I have had. I feel broken-hearted. Circumstances I can’t control even though I want to “fix” it all. I feel helpless. I pray that God uses this moment for growing and molding me to His plan. thank you for the prayer and encouragement, Rachel! My wonderful step mother Judie passed today. I just couldn’t stop crying, thank you for this prayer. Jesus, please be with Shari right now in a special way. May she know that you are with her; give her peace in the midst of this heartache. Amen. Shari, I”m so sorry. God is with you. Thank you so much, i really needed this right now. This prayer really touched my heart tonight. God bless you. Oh I needed this so much. Thank you and Love you and your sweet words! I needed to read this today. After weeks of struggle, today was the day I “almost” lost hope. Reading this gave made me feel…understood. Thank you!